Alessandro Filippini. From The Table. 1889 edition. 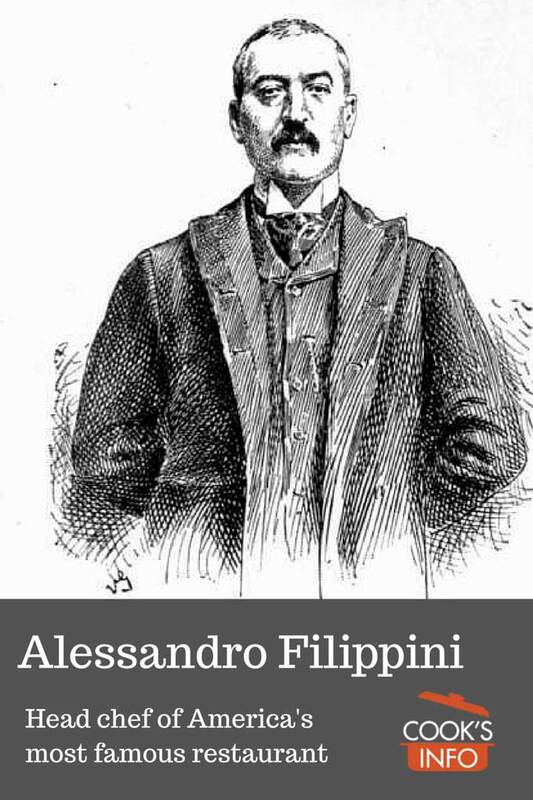 Filippini was hired by Delmonico’s in New York in 1849 by Lorenzo Delmonico. At the time, Delmonico’s had just one restaurant, at 2 South William Street. By 1884, Filippini was manager and “chef de cuisine” at their second restaurant on Pine Street. Several sources mention that Filippini left Delmonico’s in 1863; if he did, it was only for a short time, as he was at his post in the Pine Street restaurant in 1864. Filippini retired in 1888, when the Pine Street Restaurant was closed, and dedicated himself to writing more cookbooks. In the same year, he wrote a letter to Charles Constant Delmonico to ask if he could dedicate his book, “The Table”, to the family. He wrote: “Having been with the “Delmonico’s” for nearly a quarter of a century . . . ” In 1888, he had in fact been with Delmonico’s for 39 years, but if he were counting from an 1864 return to the restaurant, that would make nearly the quarter of a century that he referred to. In his cookbooks, Filippini gives precise measurements (many cookbooks of the time were still giving imprecise, general measurements.) His books were published under his anglicized name, Alexander Filippini. Basic personal information for Alessandro Filippini, such as birth and death dates, remain elusive as of 2012. “Louis Lescarboura Dies.” Oxford, Pennsylvania: Chester County Press. 3 March 1971. Page 1.